It’s easy to dismiss the impact and legacy of the original Gears of War. After all, countless clones and knock-offs have dulled the genre itself, but that’s exactly the point: Gears of War set the template in 2006. The culmination of the groundwork set by Kill.Switch and Resident Evil 4; it defined the third-person shooter and the cover system which, at the time, was the smoothest. But on its own merits, it still holds up as a tremendous game with excellent shooting, a well-woven story and some outstanding boss fights and set pieces. Gears of War follows the exploits of Marcus Fenix, an incarcerated soldier who is freed after the war calls for a strong and perhaps expendable hero. He, along with friend Dom Santiago, follows orders under General Hoffman including tracking down a Resonator which can hit the enemy where they live, finding Alpha squad and dealing with the multitude of complications throughout. Though Gears doesn’t exactly have the deepest characters, the world and its war is well built, giving you a sense of dread and lack of hope despite the war having raged on already. Marcus, Dom, Baird and Cole make for a memorable group, and there are some genuinely shocking and exciting moments. So up until GoW, very few games had nailed the third-person shooter. Some attempts had come close, notably Namco’s Kill.Switch and Resident Evil 4, but Epic’s 2006 shooter really cemented the groundwork. Controlling Fenix in a third-person view, you can aim on the fly by holding the left trigger and shoot with the right. Aiming is incredibly smooth, but what really stands out is the excellent cover system. At the touch of a button, Marcus slaps his back onto any piece of cover present, and you can either blindfire or aim out of cover, albeit at the risk of getting shot. Holding A makes Marcus sprint, and if cover is in his path, he’ll stick to that too. Even today, it’s a system which holds up well and makes shooting incredibly fun. Of course, gameplay wouldn’t be much without a strong campaign, and Gears delivers. A tightly crafted and exciting slew of set pieces, quieter moments and incredible boss fights, there’s never a dull moment. Whether it’s the incredibly tense encounter with the giant Berserker, the pulse-pounding shootout in a circular fountain where you’re flanked on all sides or the dark chapter with explosive, glowing Wretches, there are many standout moments. These are bolstered by rather good A.I., who often flank you, avoid gunfire when taking damage so they can recover and heightening aggression when you’re taking damage. It’s a campaign you can play multiple times and never become bored. The weaponry of Gears definitely goes a long way too. The lancer – a series staple now – defined itself with a mounted Chainsaw bayonet, which is insanely satisfying to use. Other weapons pack a punch, such as the Gnasher shotgun and Sniper Rifle which creates satisfying headshots. The Hammer of Dawn is also another standout, as out in open spaces, you can call an orbital satellite to drop a laser beam on any poor sod below. The other cool wrinkle to guns is Active Reloads. You’ll notice a bar moves as you reload, with three different spots. If you hit RB again in one of these spots, it can reload standard, perform a special active reload which adds improved damage to your bullets or jam the gun, meaning you’re vulnerable for a brief moment. It’s a cool dynamic that defines Gears and adds a layer of tension to every reload. That being said, there are a couple of quibbles you could raise. Though generally boss fights range from good to amazing, the final encounter is anticlimactic and dull in comparison. It’s not enough to sour the whole game, but it can leave you feeling deflated. There are also a couple of difficulty spikes which, at times, can really be genuine roadblocks. The pacing can suffer as a result, as although you can eventually pass these segments with determination, it often leaves you feeling like you’ve hit a brick wall. 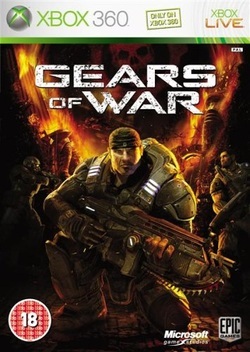 Gears was also the first game to really reinstate co-op as a mainstay of action gaming. The entire campaign can be played with a second player, but it’s not just a copy of Marcus as you take the role of Dom. This makes you feel part of the story, and there’s also some cool touches to co-op. You can revive each other if you take too much damage, which does ease some of the challenge. On the other hand though, certain segments will split you up, and some of these require very careful co-operation to succeed. The caveat is that if you go down, you have to start again. This makes these sections incredibly tense in co-op, and playing the campaign with another player is excellent. There’s also a 4-v-4 multiplayer mode which takes the fun weapons and puts them in a squad-based competitive mode, and it makes for a fun romp. Gears also set the bar for what games would look like; it was arguably the first game of the period to really look seventh-gen. Characters look thick and feature excellent animation, particularly during cut-scenes. Environments are dark, gritty and beautifully crafted. And there are a lot of cool touches, such as the Ink-filled sky during a train chase or how the camera shakes when you sprint, almost like a documentary camera trying to keep up. The audio is also awesome, with gruff dialogue fitting the characters and tone, the weapons pack a punch – particularly the chainsaw bayonet – and the music is appropriately cinematic, adding heft to each sequence when necessary. So while it’s easy to criticise Gears of War for potentially starting the trend of generic, muted-looking shooters, its legacy and craft cannot be disputed. Even a decade later, the shooting is still fantastic, with cinematic and action-packed heft that only a top studio can pull off. The game set the bar for action, presentation and technical prowess for years to come, and helped Microsoft kick-start their Xbox 360 to great success. There are quibbles, such as weaker and more frustrating moments, but these aren’t enough to ruin the game. It’s superb, no discussion.